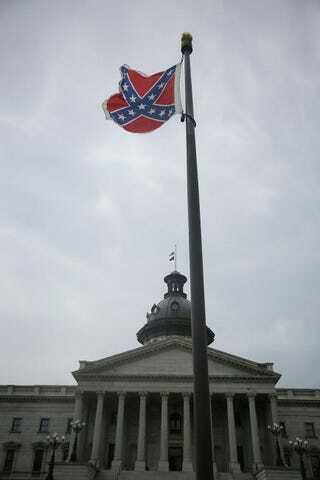 The Confederate flag flies on Statehouse grounds June 22, 2015, in Columbia, S.C., after South Carolina Gov. Nikki Haley announced that she will call for the Confederate flag to be removed. The Confederate flag that flies on South Carolina Statehouse grounds is one signature away from being removed after the state House of Representatives passed its final vote on the measure early Thursday morning, Reuters reports. According to the report, state representatives, on their third and final vote, passed the measure with a sweeping 94-20 vote in the early hours of the morning. All that is left is for the bill to be signed by Republican Gov. Nikki Haley and made into law. Haley had already made it clear that she would sign it. The controversial symbol became the focus of heated national attention after nine people were killed, allegedly by gunman Dylann Roof, at the Emanuel African Methodist Episcopal Church in Charleston, S.C, during a Bible study last month. However, some were still hesitant to remove the battle flag, which many Carolinians and other Americans see as a symbol of Southern pride. Some state Republicans attempted to compromise, seeking dozens of amendments, ranging from replacing the battle flag with another Confederate flag to flying it only once a year on Confederate Memorial Day. "I grew up holding that flag in reverence because of the stories of my ancestors carrying that flag into battle," another white Republican, state Rep. Michael Pitts, added, addressing the House. But many opponents, across party lines, who see the flag as a symbol of slavery and racism refused to be swayed, settling for nothing less than removing the flag altogether and placing it in a museum. “The people of Charleston deserve swift and immediate removal of that flag from these grounds,” state Rep. Jenny Anderson Horne, another white Republican, said while addressing the House, according to the New York Times. Read more at Metro News and the New York Times.